I find playdough to be a very useful homeschooling tool. 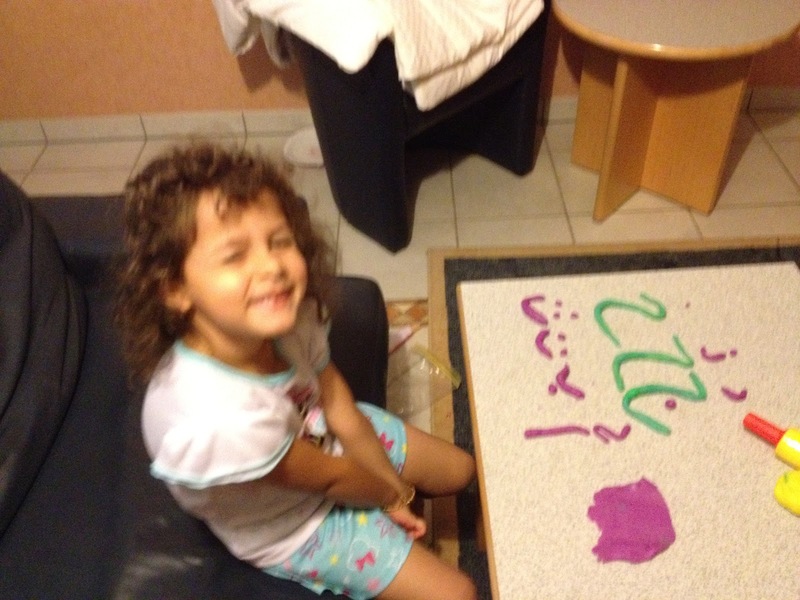 It can easily turn a dull worksheet activity into a vibrant, creative, hands-on activity. 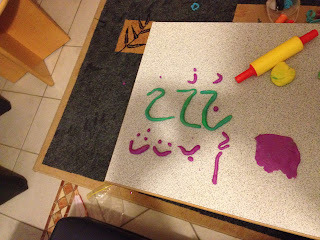 We did this a while back while introducing the Arabic letters and I have been meaning to share it. I was using lots of worksheets at the time but she insisted on playing with playdough after she was visibly bored. In the interest of not getting side tracked from our days lesson I suggested we make the letters out of Playdough. It turns out learning Arabic letters are a lot more fun when you get to roll, cut, and mold them. I believe it also is helpful for the visual understanding of the symbols because they are recreating them by hand which takes quite a bit of mental and physical work. Arabic letters are not easy to grasp unless you are constantly working with them. We still use worksheets but I try now to supplement more with activities such as these, which I feel gives it more of a Montessori touch. 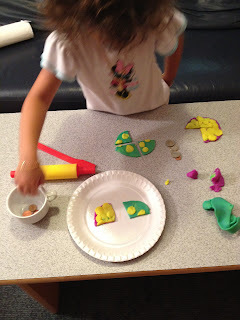 After the letter making, she wanted to just play with the dough, so I sat with her making cut outs of various objects with the cookie cutters they provide. By doing so we ended up playing a pizza restaurant game. Where we made pizzas with various toppings. Then she would stand on one side of the table and I on the other, and we would take turns ordering slices of pizza from one another. What was great is that it quickly turned into a basic math lesson on fractions and counting. By slicing up the pizza we discussed a Half, a third and a quarter. I also got a cup of loose change and we would pretend to buy our pizzas with the money which is a great lesson in counting, addition and subtraction. Playdough is also a great way to keep toddlers busy while you are homeschooling your older children. Mine loves to mush it, throw it, even eat it, and a 15 month old will have no problem making cut-outs with the cookie cutters, and is great for the motor-skills development.